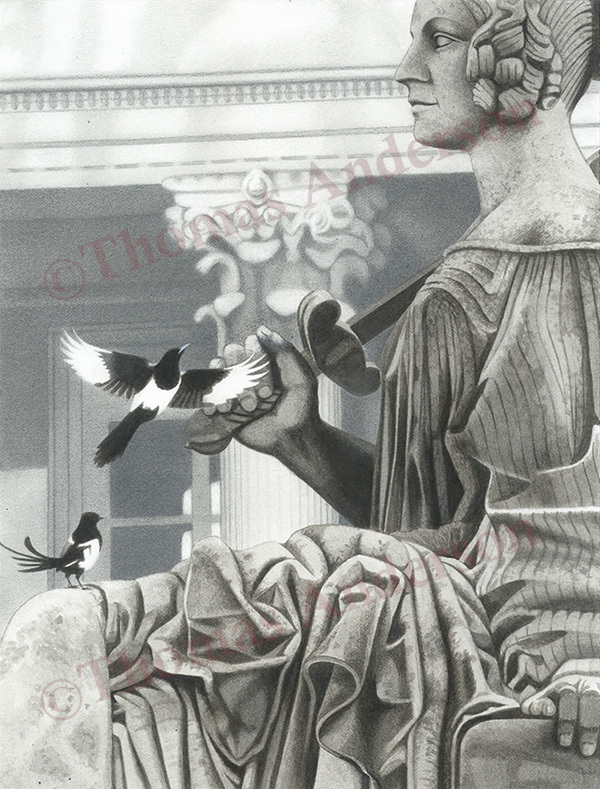 "Place de la Concorde Magpies"
Ink & Graphite, 13" x 10"
I took a break from oils to create a series of small drawings that capture a few moments from our time in Paris. Drawing with mostly ink (and some some graphite and watercolor to get at different textures) is a fast and immediate but unforgiving way to work. Birds were, as they always are, everywhere in this beautiful, mesmerizing city, and I liked interaction between the birds and the art and art history. This was the first in that series. Magpies have adapted well to urban life in Paris and we saw them throughout the city. Here they appear to be taunting a mythological character that probably should not be messed with.